Sustainable builder Model Remodel (www.modelremodel.com) has moved to 1111 W. Nickerson St., near the Ballard Bridge. The company moved from 1287 Westlake Ave. N., after learning the office was being torn down for mixed-use apartments. Model Remodel works on a wide range of projects, including bathrooms, kitchens, basements, additions, new construction and small-scale commercial. The company achieves sustainability through waste diversion, energy-efficiency upgrades and material selection. It won awards in Green Remodeling Excellence the last two years from the Master Builders Association of King and Snohomish Counties. Salvaged materials are at the heart of the new office’s design. 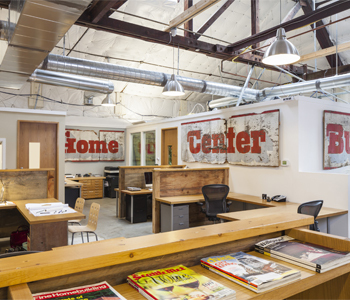 The desks are door slabs from a salvage company, the partitions and trim come from salvaged concrete-form boards, the barn-wood accents come from a deconstruction job on Whidbey Island and the signs from a throw-away pile off of Nickerson Street were salvaged many years ago.